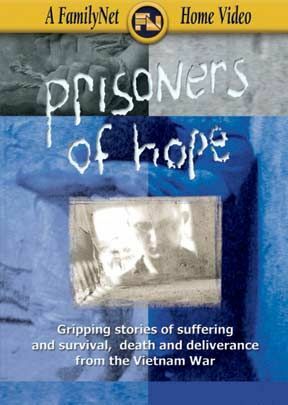 The old adage that "there are no atheists in foxholes;" takes on special meaning in this uplifting story of 10 American POWs from the Vietnam War who suffered the same torture sessions, sleep and food deprivation, and inadequate medical treatment as their secular comrades in arms, but credit their belief in God for helping them endure the unspeakable horrors they encountered. Even today, decades removed from their experiences, the men's emotions are not far from the surface, as statements of faith are combined with tears of remembrance. Sometimes difficult to watch because of the powerful stories and the historical footage obviously taken by the North Vietnamese, Prisoners of Hope is not a maudlin Christian's creed; on the contrary, this is a moving tribute to the intangible power of faith, a professional production that illustrates how 10 ordinary men clung tenaciously to their sanity thanks to their religious convictions. Definitely recommended for both public and church libraries. Can't speak highly enough about his film! Not many films have impacted us in the dramatic way this one did. The faith and strength that the prisoners had is truly amazing and inspiring. Makes you more than grateful for their sacrifiecs. AN ABSOLUTE MUST SEE. Every American man woman and child should watch this movie in order to understand what our service men and women have endured for our freedom. We take it so lightly when so many have given up so much for us. This movie gives just a small glimpse of how these captives were tortured how much they suffered and through their faith in Jesus Christ are here today to tell of that experience.